OAK BROOK, IL--(Marketwired - Jul 2, 2015) - The Minions from Universal Pictures and Illumination Entertainment are taking over McDonald's restaurants and bringing fun to customers of all ages around the world in one of the company's biggest global promotions. From the U.S., Brazil and Spain to China and Australia, customers of all ages are experiencing a wide range of Minion excitement from McDonald's. Minions, a prequel in the Despicable Me global film franchise, debuts in U.S. theaters on July 10. McDonald's and Minions share the love of yellow and bringing fun to families around the world. The most "Minionized" restaurant is located in the heart of Chicago with more than 400 Minions appearing on the outside of the restaurant -- from top-to-bottom windows and the drive-thru to tabletops and the front counter -- taking nearly 50 hours to assemble. Today's reveal at the company's iconic restaurant is timed with the launch of the North American Minions Happy Meal on July 3. In addition, markets around the world will feature exclusive Happy Meal toys celebrating key Minion moments from the film. To celebrate the Minions favorite food, "BA-NA-NA," McDonald's is offering special banana-inspired menu items in select countries. In the U.S., customers can enjoy a new Go-GURT® Low-Fat Strawberry-Banana Yogurt available in both Happy Meals and ala carte, and McDonald's Australia featured fresh bananas for a limited time as part of its special Minions Happy Meal. Banana favorites for other members of the family include a BananaChocolate McFlurry being offered in several markets in Asia and the Middle East. Customers in Austria can enjoy a banana shake, while McDonald's Brazil is featuring Minion-shaped potato cakes. McDonald's markets across the globe are featuring additional fun promotions for consumers of all ages. In the U.S., starting July 7 customers (13+) can play like a Minion in the "Minion Mania at McDonald's" game. Customers who buy select menu items, including the Egg McMuffin® sandwich, Big Mac® sandwich and 10-piece Chicken McNuggets®, can win instantly free McDonald's menu items, trips to Universal Theme Parks, digital movie downloads or Minions movie tickets. In addition, customers can use the unique code found on most game pieces to enter online for a chance to win $250,000 each week for four weeks. McDonald's is the world's leading global foodservice retailer with over 36,000 locations serving approximately 69 million customers in over 100 countries each day. More than 80% of McDonald's restaurants worldwide are owned and operated by independent local business men and women. To learn more about the company, please visit: www.aboutmcdonalds.com and follow us on Facebook and Twitter. The story of Universal Pictures and Illumination Entertainment's Minions begins at the dawn of time. Starting as single-celled yellow organisms, Minions evolve through the ages, perpetually serving the most despicable of masters. Continuously unsuccessful at keeping these masters -- from T. rex to Napoleon -- the Minions find themselves without someone to serve and fall into a deep depression. But one Minion named Kevin has a plan, and he -- alongside teenage rebel Stuart and lovable little Bob -- ventures out into the world to find a new evil boss for his brethren to follow. Illumination Entertainment, founded by Chris Meledandri in 2007, is one of the entertainment industry's leading producers of all-audience event films. In July 2010, Illumination, which has an exclusive financing and distribution partnership with Universal Pictures, released its first film, Despicable Me, starring Steve Carell, which earned more than $540 million worldwide and launched a beloved global franchise. With the success of 2011's Hop (more than $183 million worldwide), 2012's Dr. Seuss' The Lorax and 2013's juggernaut Despicable Me 2, Illumination's films have made almost $2 billion. Universal and Illumination's next film Minions, starring Academy Award®-winner Sandra Bullock and Jon Hamm, written by Brian Lynch, and directed by Pierre Coffin and Kyle Balda, arrives in theaters on July 10, 2015. Fans may also experience Minion Mayhem in 3D with the Ultra-HD movie motion simulator adventure at Universal Orlando Resort and Universal Studios Hollywood. 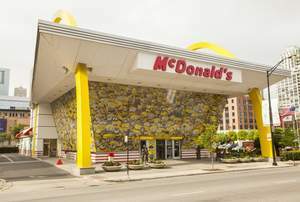 Chicago's "Rock 'n Roll" McDonald's -- located on 600 N. Clark Street -- transformed into Minions mania, the largest Minion restaurant takeover in the world.